Harper is wearing one of her 31 costumes for the month of October! She dresses up everyday in October since she was born! This is her 8th year! #1 World Series Ball & Glove! 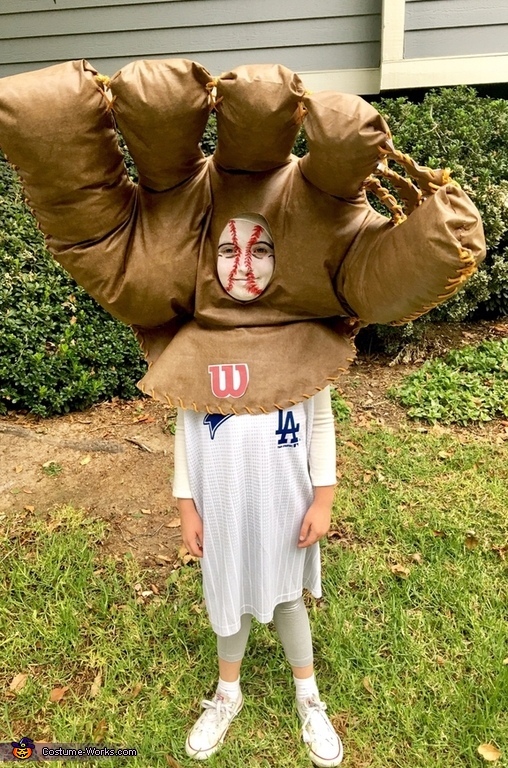 This costume idea came from the big World Series Game. We started with vinyl fabric and hand stitched the glove. We used stuffing to shape the glove. I was amazed my daughter worn it the whole night! Everyone was excited as they were watching the game plus updated us on the score!! #2 Pixar Luxo Jr. Lamp! This costume start when someone gave us the ball. It gave us the fun idea of the lamp. We used a lamp shade, foam board, & some household items from the dollar store. #3 The Island of Te Fiti from Moana! My daughter loves the movie and thought this would be amazing so we gathered up all the green stuff and started glueing them together.